Turn off that light, dummy! 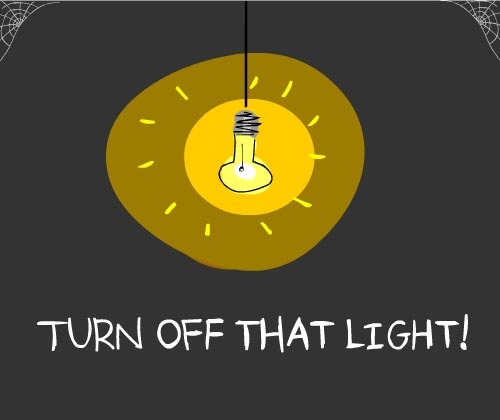 “Turn off that light!” That shrill command has been ringing in my head since last winter when we got serious about reducing our hydro usage. I studied the bill carefully… Only a 10% reduction? Not that I’m competitive or anything but I thought we’d done better than that! In fact, we have reduced our usage by over 20%. But Toronto Hydro is not awarding gold stars for overachievers. The good news is we earned a 10% Summer Savings credit. Not bad. And thankfully we didn’t have to sign up for any program — Toronto Hydro just went ahead and did it. They awarded the 10% discount to any consumers who qualified. Super easy. No red tape. I like that. Now you’re probably imagining us as heroes for doing without electricity… But it was so easy. #2. We unplugged the Beer fridge (not kidding). We finally gave it the heave-ho in September. More room in the basement now! #3. We turned off lights whenever we left a room. It’s a habit that’s easy to pick up if you think about money being wasted. #4. We switched to the new curly (CFL) light bulbs. But we also have lots of Halogen lights, so that didn’t make a big difference. #6. We reduced the use of our electric dryer with the installation of a low-cost solar linear-drying device — otherwise known as a clothesline. (Thanks to Green Party Leader Frank de Jong for that fancy moniker.) I would have used the clothesline a lot more but I haven’t solved the problem of scratchy, sandpaper towels. I tried eco-fabric softener but that only helped a little. But, hey… this feels pretty good. I’m encouraged that our little actions made a difference in our pocketbook. And in reducing our footprint. We’re adapting to the new reality of climate change. Now if I can just reduce our use of water…. Illustration by Franke James, MFA and Nerdheaven Ltd. I am impressed Franke! Great suggestions for all of us, as well. I yet have to ‘invest’ in a clothesline. We have a small drying rack in our laundry room, where we hang our towels. Regarding the sandy feeling of air dried towels, I can definitely relate. I protested at first, but now I am used to it, and I have even gotten to the point where I like scratchy . . . I hung clothes on the line for about 10 years, when I owned my own home. I loved hanging on the line. scratchy and all… my current landlord is considering a line here. i’d be so delighted. I’d be curious how to reduce water consumption too. I wish I could think of a good solution for hanging my clothes out to dry even in Vancouver’s rainy season. Does anyone have any suggestions to get around this? Thanks Robin! Glad you like the image. Please send me details on your project. Maybe I can feature your green initiative on the site! I just came accross your site Franke, and I wanted to challenge you a bit on this post. When you run an electrical appliance, all the energy eventually becomes heat. In the Toronto winter, that will help heat your home, reducing the amount of gas your furnace has to burn. Did you know that the Ontario electricity grid only emits about 0.14 kg of CO2 per killowatt-hour? That’s just slightly less than natural gas. So, you’re actually doing better for the climate to leave your lights ON during the winter!